Recently the United States government shut down a portion of its workers. These individuals are either working or are furloughed, both not being paid. This can have a detrimental impact on bill paying and credit scores. Credit Sesame wants to give those who are directly or indirectly impacted information that can help keep their credit scores from plummeting. Even a month of not being able to pay bills on time can adversely affect your credit score and can also affect your ability to refinance a loan, take out a new loan, or even get a credit card with a low interest rate. We here at Credit Sesame want to give consumers as much information as we can to help you. This article will look at ways to stop your credit score from dropping, and if your credit score already took a hit, how to start repairing it. Payment history. Your payment history has the single biggest impact on your credit score of all factors. Always make at least the minimum payment, and make all of your payments on time every month. Credit utilization. This is basically how much of your available credit you’re currently using. For the best score, you should aim to keep this number at or below 30% (some experts even suggest trying to stay below 10%, although this can sometimes be difficult). Length of credit history. The length of your credit history also factors into your score. Always keep your oldest accounts open and in good standing. Types of current credit. Creditors and lenders like to see a responsible use of a mix of credit types. If you only have credit cards, consider adding a credit building loan. Similarly, if you only have something like a student loan on your credit report, consider applying for a credit card or store account card. Account inquiries. The number of credit inquiries for your account can also impact your score. Soft inquiries (when you check your credit yourself) do not affect your score, but a hard inquiry, such as when you apply for a new credit card, can. Limit the number of your applications for the best score. That means keeping a sharp eye on your score during the government shutdown will not hurt your credit score. Now, let’s look at just how much each of these factors can impact your score. The most important thing is payment history, followed by credit utilization, both factors that can be directly affected by the government shutdown. Missing just one payment can adversely affect your credit score not just for one month, but for the foreseeable future. In fact, missed payments can stay on a credit report for up to three years. Sometimes missing a payment, or having to push it back is unavoidable, and you won’t be the only one that this has happened to. It may seem that your financial future is ruined, but it isn’t. Source: Credit Sesame interviewed 600 Members who had missed a minimum of three payments to creditors over a two year period. The participants were divided by credit ranking and their scores averaged. The study was conducted May 2016 over a period of three months. Missed payments can have a drastic and long term effect on your credit score as shown in the chart above. For someone that had a credit score of 800 or above, just one missed payment can mean a 6% drop. If your credit score is good at 702, the drop with just one missed payment is only slightly less at 5%. Do not wait until you have missed a payment to speak with creditors or utility companies, be proactive and speak to the creditors immediately if you feel that you may miss a payment. Speak to them about either pushing the payment due date back, or by lowering the minimum payment to something more manageable given your specific circumstances. If you have automatic payments already set up, make sure that you have enough money to cover all of the bills. You don’t want non-sufficient fund fees on top of your banks negative balance fees. Another factor that could be directly impacted by a government shutdown is your credit utilization. Your credit utilization ratio counts nearly as much as payment history. Credit utilization is the amount of total debt versus total credit limit. Very high credit utilization, or amounts owed, means that your cards may be maxed out. For example, if you’re carrying $3,000 in debt with a $4,000 combined credit limit, your credit utilization ratio is 75 percent. Individuals use credit cards when they do not have a steady income, and there is nothing wrong with that on a short term basis. However, if you are not careful you could bump your credit utilization above 30% which decreases your credit. 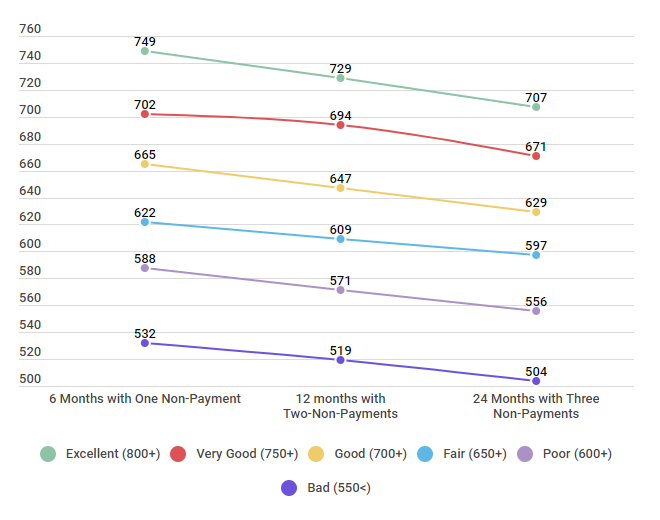 Source: Credit Sesame surveyed 600 Members with 100 participants divided among each credit ranking. The poll was conducted October 1, 2016 and concluded April 10, 2017. The more you use credit cards, the higher your utilization is, especially if you are unable to make large payments towards the balances. If you find yourself unable to make your monthly payments due to the government shutdown, or in general, the first thing you should do it work with your creditors. Not all creditors report to credit bureaus, and those who do may not report to all three. It is important to know which creditor reports to which bureau. Not all landlords report rental payments, and even some “buy here, pay here” car dealerships don’t. The number one factor in your score is your payment history. Late payments quickly drop your credit score. Each payment helps, but just one missed payment can wreck that progress. If you miss a due date, make the payment as soon as possible since lenders typically don’t report a payment late until 30 days after it is due. Call and speak with creditors. Explain your situation, and see if both you and the creditor can come to an agreement. Do not yell, or get mad at the creditor for doing their job, which is to collect on a debt. Some creditors have stated that they are willing and able to work with those affected by the Government shutdown. The following is a partial list, but remember that it is ultimately up to creditor. * Also just because your specific creditor is not listed, does not mean that they are not willing to help. Communication can be a great help in trying to financially survive during the shutdown. *This list is as of January 23, 2019 and may change without notice, please reach out to your individual banking institution for more information on what assistance they are able to provide. When budgeting, look at the most important things, rent/mortgage, utilities, etc. Prioritize your bills from most important to least important. Yes, something may seem really important, but look at everything objectfully. For example, do you need Netflix if you also have Hulu and Amazon Prime? If the answer is yes, then okay, because everyone is different and have different needs. If the answer is no, then see if you can suspend your membership or alter the terms of your contract with the provider. Pay the most important things first, and then go down the list. If you do not have enough money to pay the bills at the bottom, then it is what it is, and there is nothing you can do about it. Stressing over that fact is not going to help you, or your family in this time. One thing that some consumers do when they are prioritizing their bills is forget about the little things, food, daycare, and even fuel for their vehicles. If you have not budgeted for food in the past, this may be a good time to look at what you have in your pantry and decide what you will need for the next week. Many studies have shown that some communities only have food for three days in the event of an emergency, so prepare yourself as if you couldn’t run down to the store and buy what you need. There may be food at the store, but you don’t have the resources to buy that food. Each inquiry into your credit, which is what happens with each credit application, can drop your score by a few points. Soft inquiries–which include employment checks, self-checks, and inquiries to prequalify you for promotional offers–do not hurt your score. Hard inquiries are those made as the result of an application for new credit. Those are the inquiries you need to limit. Especially during this time, you do not want anything extra decreasing your credit score. While it may seem easy to just use your credit card, remember at the end of the month, you will be responsible for making those payments, and if you are unable to, then your credit will decrease because of it. Push back large purchases unless they are necessary, and keep spending within your means, and that means new means, not previous means. Banks and Credit Unions have stated that they have money allotted for zero percent loans for those affected. While this may seem like a good thing, and for some it is, be careful with taking out a loan, especially if prior to being without a paycheck you did not have a lot of expendable resources. As with any loan, you will have to pay it back. If you have already missed a payment or ran up a credit card, it’s okay, you are not alone and there are ways to increase your credit score. If your credit score has already taking a hit, there are a number of ways to improve your credit score, both in the short term and the long term. We’ve gathered our favorite quick tips as well as general advice for improving your score below. You can also join Credit Sesame for personalized recommendations on improving your credit score. Nothing is flawless. Mistakes happen. Error correction is the simplest way to improve your score now. According to the Federal Trade Commission, approximately one out of five consumers has an error on at least one of their credit reports. Don’t let misreported information be the cause of poor credit when it’s relatively easy to fix. Source: Credit Sesame surveyed 2500 people who check their credit report. The study was conducted February of 2018. Regularly checking your credit report is an essential first step toward improving your score. If you find an error, you have the right to dispute the information. Check out this article about how to dispute errors and help your credit. Sometimes we learn best from those who, like us, have faced adverse situations. Haley is not part of the government shutdown, but her husband hurt himself on the job and was out of work while he recovered. We interviewed Haley P. on November 10, 2017. She earns $39,000 a year and is 40 years old. She lives outside Memphis, Tenn. She’s married with one child and is working as a grocery store manager. What did you notice about your credit score and/or credit report after missing a payment? My husband got hurt on the job. He works as subcontractor putting in cabinets and kitchens but when a cabinet fell on his chest, it broke his clavicle. He was out of work for the rest of the year which was a good six months. We had to make a few hard decisions about what to pay and those discussions turned to arguments. We were both frustrated. He was hurt and taking care of our daughter, our dogs, and the house and he forgot to remind me to pay our credit card. A month later, I got a notice my credit report changed. It had dipped almost 25 points! Thankfully, we only had to miss one payment. We called the credit card company and they temporarily lowered our monthly payment until my husband was back at work. What do you plan to do to make sure it doesn’t happen again? I’ve automated all our monthly debits in our personal banking account. It even sends a notice to the program when the money is taken out of the account. We’ve used the compensation my husband received for his injury to pay down our credit card balances. What we had leftover has been placed in an interest-bearing savings account. Just like with anyone, Haley had a lot of things going on, and forgot to pay their credit card. Setting up credit monitoring and regularly checking your credit report is an essential first step toward improving your score. Even if you have good credit, and you do not expect the government shutdown to adversely affect you, it’s still a good idea to take some of these tips into consideration. When it comes to improving your credit, there really is no time to waste. The higher your score, the lower your interest rates will be and the easier it will be for you to obtain credit. With a little hard work, an excellent credit score rating is within reach for most Americans. For many, the Government Shutdown brings about unknowns and insecurities. There is no way around that, but we hope that by reading this it will give you a step up. Even if your credit decreases, there are ways to increase it, and one misstep will not spell disaster for ever. Take things slow, pay attention, and use the steps detailed in this article to do the best you can during this difficult time.